Brew Facts: Westbrook has a good relationship with Evil Twin. So good, in fact, Westbrook contract brews the various Femme Fatale versions, Lil B (great porter), the Cowboy, Hop Flood, and the fantastic Even More Jesus for the East Coast. Appearance: Thick, lumpy cream ball of a head bubbles away quickly and leaves a fluffy island of ice creamy bubbles. By the time I get the picture, the glass is dirty with thick threads of lacing. The glass is absolutely coated by this heady webbing and a poster child for Brussels Lace. The beer color is a cloudy mixture of yellow with a twinge of auburn, giving it a hazy ice tea quality. What many pale ales lack this beer just screams, and that’s body baby. Love the look. Aroma: I take a sniff and “Ooooh, dank” involuntarily escapes my lips to the indifferent ears of my cat. This is a shot of pink grapefruit and pineapple with a fresh hop and dank rye undertone. The rye is to the point of almost being toasty and keeps the light sweetness under control. Nice aroma that promises a tongue kicking of citrusy farmhouse with just a touch of sweet. Taste/Mouth Feel: Based on the appearance, I anticipate a much chewier body, but this skirts thin to just hit a medium body. Still has more body than most pales, but I readjust my expectations. I sip and the taste is spot on to the aroma, however my tongue remains un-kicked. This beer is a mild summer drinker that hits the right balance of pineapple/grapefruit sweet (even writing that feels too strong), and just a hint of rye dank and hops. The rye wraps into the bready finish with some toast. It has a bitterness, but it blends in so nicely with the rye that I’d barely comment on it. If the rye isn’t already a deal breaker, non-IPA lovers could probably handle it if they had no other options. I will note that as the beer warms, the hoppy qualities become more intense. 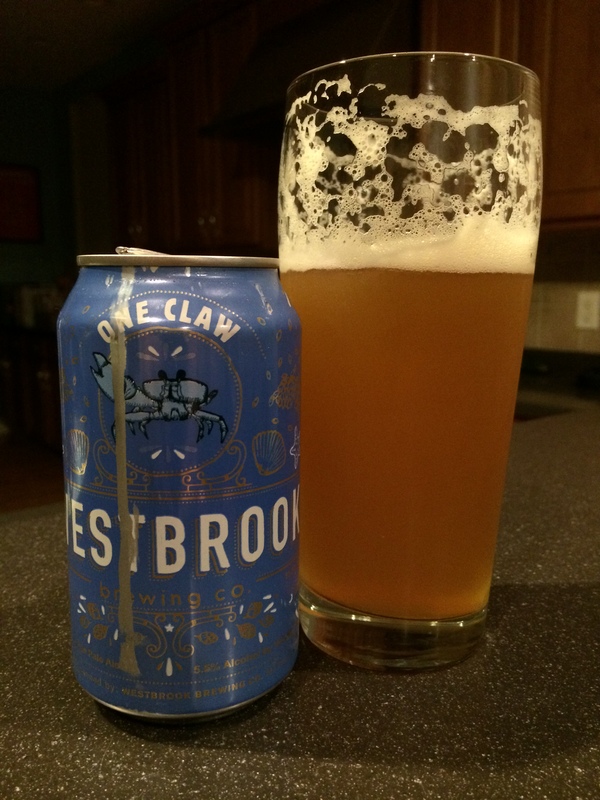 Final Thoughts: Having only recently had Westbrook’s Gose, video review available soon, and now One Claw, I have limited experience with Westbrook. Actually I’ve also had the RIS collaboration with Evil Twin now that I think about it, yeah me. Regardless, these beers have proven to me that Westbrook is a brewer to watch. The drinkability of One Claw is strong, making for a great session beer that is full of flavor and rides the line between overindulgence and a watery bore. This beer is a success because of the toasty rye and biscuity finish that makes you want to go back for more, but an appreciation of mild dank is a must. Lovely and refreshing with plenty of flavor, but subdued enough to avoid palate fatigue. This may not be bold enough for some, but an easy recommendation for me as a go-to session beer.